The US Fish and Wildlife Service is in the process of updating the Comprehensive Conservation Plan (CCP) that will guide the management of the Deer Flat National Wildlife Refuge and Lake Lowell for the next 15 years. The next revision is due out in June, 2012. There's coverage of the issues—and contention—in the Idaho Statesman, on May 27. Another meeting with Refuge management is in the works. Founded with an organization meeting at Barclay Bay on April 27, 2006, our informal group works with the Lucky Peak management and the Corps of Engineers to protect local recreational access and what other projects prove worthy. 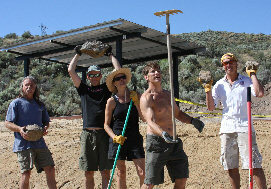 We've held regular work parties (including on in May, 2012) to help enhance the Barclay Bay beach. The Upper TV weather page has NOAA observations for Caldwell, Boise and Mountain Home, and the links you need to know where to go sailing locally, designed for fast compilation of the best weather information. The latest version of the sailors email list is the Boise Sailors Association Google Group. Follow the link and sign up. Drop me an email (change the "at" to @ and take out the underscores) if you don't get fast enough response to a subscription request. NOAA/NWS products are constantly changing, and almost always improving. As of Dec. 2009, the best place to see everything right now is the interactive application they've built with Google Maps. Start with the "Boise region" view, and if you like you can pan and zoom to an area of interest. 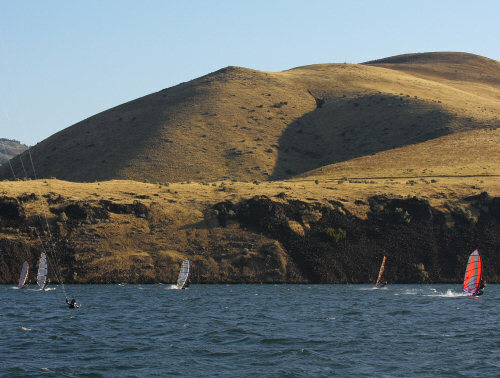 Lucky Peak in 2008, 5 boardsailors and a kiting chum. Photo courtesy of Eddy Petranek. The best on-line prediction seems to be the Unisys meteogram, giving a 60 hour forecast. It takes a bit of study to understand it; the main trick is that the times are UTC, 6 hours ahead of MDT. So 1200 UTC is 0600 MDT, just before sunrise. For current observations, high pressure is good. SE wind at the airport, and E in Mountain Home and Caldwell is the prime indicator, the stronger the better. Caldwell seems the least reliable indicator, Mountain Home may be the best. Forecast "hot" weather (with the threshold getting lower later in the season) is good, any hint of W or NW flow is bad. The RAWS at Lucky Peak Nursery was decommissioned in late 2012; The ITD sensor at Highland Valley Summit was added in April, 2013, but I don't know its patterns yet. Snowkite Solider and Gear Daddy LLC promote backcountry snowkiting in Idaho. What this (sub)site is about, what's new about it, more reference links. Air Sports Net has a sort of nice graphical treatment of NOAA's forecast models, now larded with advertising. The Boise, ID National Weather Service page has links to these and much, much more, along with the current forecast. The Bureau of Reclamation has a teacup diagram online, showing the status of the Boise and Payette river watersheds succinctly. The Navy's sunrise tables calculate times of sunrise/sunset, moonrise/moonset, and the beginning and end of twilight, for one year, for any location in the world. Neat trick. I've been a happy Windance customer over the years. They have a web cam page, and Dave's Windance blog is nice. Hatch Cam has views of the Hatchery, Swell City and Rowena. Sailworks has a Gorge Wind cam image collection that may be useful. Especially if they make the image sizes more consistent? iWindsurf reports for sailing spots around the world. Excellent coverage with public and private sensors, pretty good forecasts. All but the public sensors and wind archives now require a paid subscription, though. I made photo travelogues of three trips to the Gorge back in 2001: Number one, two, and three. The Magic Windsurfers have a website now with sailing reports, photos and the like. I've got more than a decade of weather data and daily sailing reports in cold storage. Send me an email if you want a magical history tour. Ken Poulton's SF Bay area site, with automated collection of public sources for realtime observations, forecasts, etc. Francois Jouaux' charts of wind for the last few days in California, the Gorge, et al.